To stop a car, the brakes have to get rid of that kinetic energy. They do so by using the force of friction to convert that kinetic energy into heat. 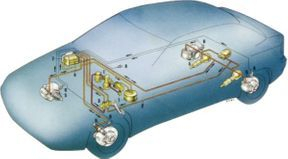 When you press your foot down on the brake pedal, a connected lever pushes a piston into the master cylinder, which is filled with hydraulic fluid. Brakes are one of the most important safety features on your vehicle. There are different types of brakes, both between vehicles and within a vehicle. The brakes used to stop a vehicle while driving are known as the service brakes, which are either a disc and drum brake.